As prop and costume makers who frequently use high powered tools, eventually one of us was probably going to have a bad shop accident. See also, Murphy’s Law. In my tiny world of prop and costume makers, just such an accident happened recently to a friend of mine. tl; dr Us prop makers sometimes make and use tools that can be extremely dangerous. Always use good equipment the way it was designed to function with proper safety gear and practices. Recently my pal Harrison Krix from Volpin Props had a sanding bit come loose from his rotary tool that bounced off his safety mask. 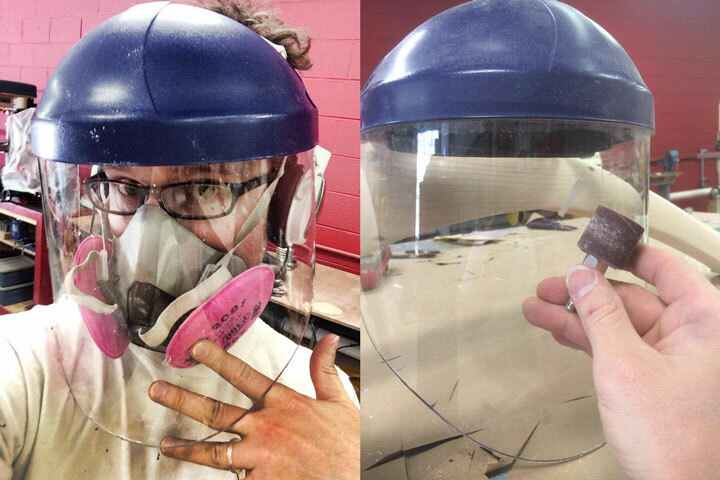 A testament to always wearing eye and face protection when working with power tools. Harrison Krix from Volpin Props displaying some good shop safety. Things don’t always go so well though. A couple of weeks ago I heard through the grapevine that my pal Chad was in the hospital after some kind of explosion in his shop. Details were fuzzy, but we knew that he was alive. Unfortunately, his face area had suffered some serious trauma. I will not be going into those gnarly details. As he began his recovery in the hospital, we were able to get Chad’s first hand account of what happened. He was using a pressure pot with a self made acrylic lid. At some point, that lid on the pot gave way under the pressure, exploding. His poor face was near the lid and absorbed a lot of the blast. To be totally blunt, he is lucky to be alive. In fact his beanie hat may have saved him from a plastic shard that could have gone right into his head. He is indeed still alive, thankfully, and recovering as well as can be expected. Chad is a great guy and a fantastic maker, so we’re all happy to still have him around! What went wrong? It is very common for prop makers to build some of their own equipment. If you want a vacuform table, for example, the only way to get a good one is to make it yourself. In hindsight it’s easy to see that building his own pressure pot lid was a really bad idea, but you can see how a skilled maker, like Chad, might be confident enough to try it. However, he made one small oversight in the build process that made all the difference between a good, safe tool and a dangerous injury risk. How could this have been avoided? Using a commercially made pressure pot would have done it. End of story. Again, even though you might be a well trained professional, there are some tools that are not worth the risk to build your own vs shelling out the cash for a commercially made one. Also, before you ask, a face guard like the one Harrison was wearing would not have helped Chad one bit. It would have been like shielding yourself from a grenade with a paper towel. Still though, wear your safety goggles whenever working with power tools. For real, you guys. Chad and many of my prop maker friends have the building experience to make some really cool, high powered, and supremely useful tools. With those skills comes the ability to build some pretty dangerous stuff. I personally would not feel confident in my own abilities to build my own lid for a pressure pot, especially since good, commercial models are readily available for purchase. For beginners, I cannot stress how important it is to buy and use reliable tools that are meant to do the job correctly.